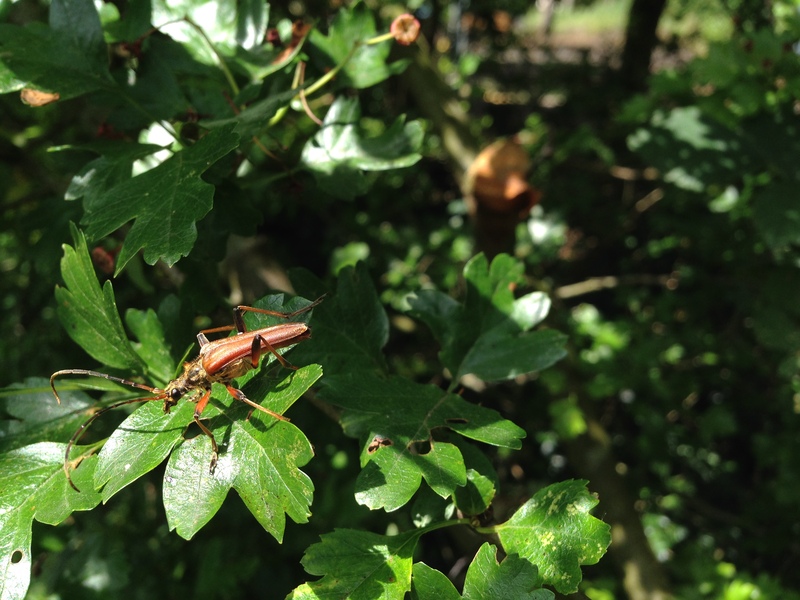 Well, you wait for two months for a new post, and two come along at once. (well, one actually, as I’ve combined them, but you get the idea). Since my last post, announcing the near completion of the foundations, I can now announce the near completion of the foundations, only more so. 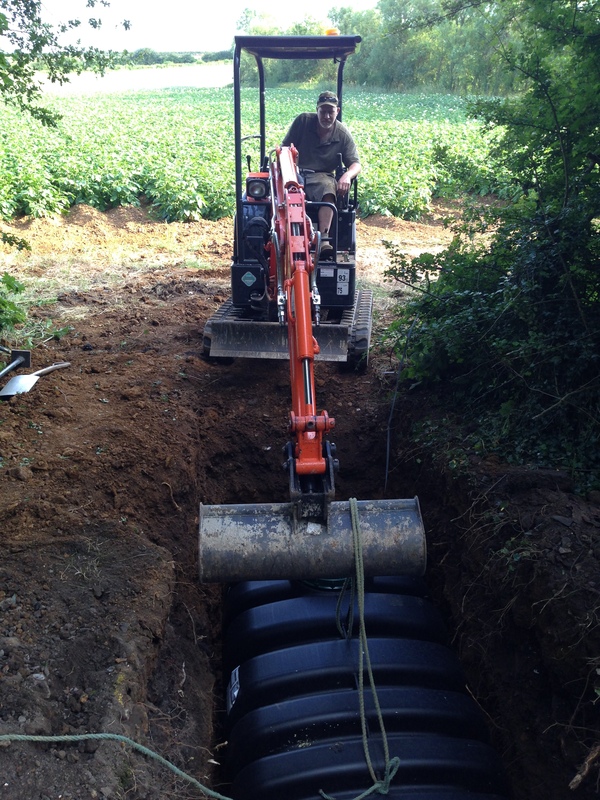 At the end of May, a further herculean effort from myself, Katie, Tony, Chris, John, Jim and Archie, we finally filled the last trench of the foundations with tyres and gravel. 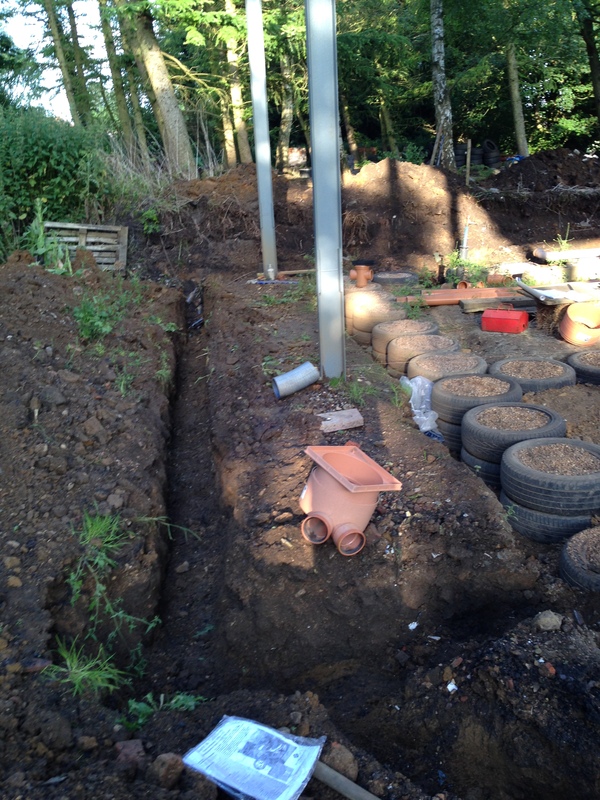 So, after 8 months since we first broke the ground, all our wall foundations are complete. However, there’s still work to do to these before we can put walls on top of them. The outside walls need another layer of tyres above ground level, and then a ply-board and timber ‘wallplate’ box section to form the base on which we’ll build the straw walls. For the internal brick walls that will be the thermal mass for the passive solar, and support the stairs, we need to lay several courses of steel reinforced trench blocks to level and support the weight of the bricks. This is all still to come, once we’ve worked up the courage to start! However, the next job, that we threw ourselves into, hot on the heels of the foundations, was the drainage and sewerage systems. 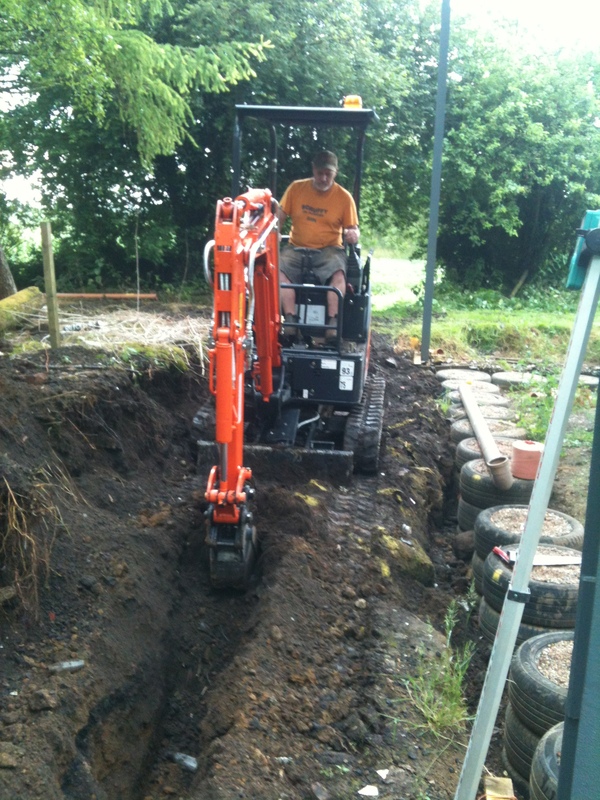 The enthusiasm was largely mine, because it involved another digger! 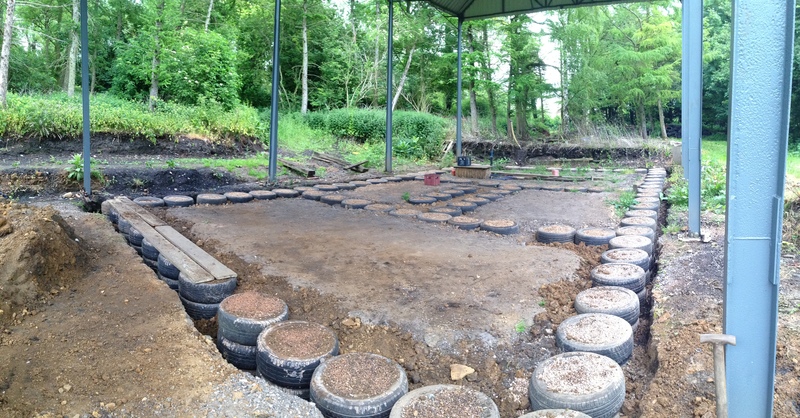 So, although finishing the foundations meant no more tyres, it didn’t mean no more holes in the ground. 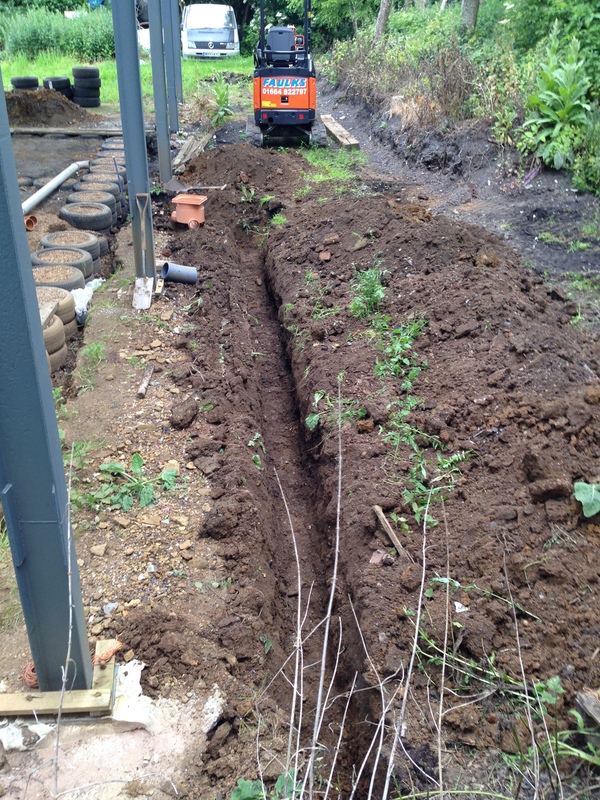 Another week-long digger hire meant 2 days off work, and a lot of after work evenings saw us dig about 30 metres of narrow, and sometimes very deep, trenches. 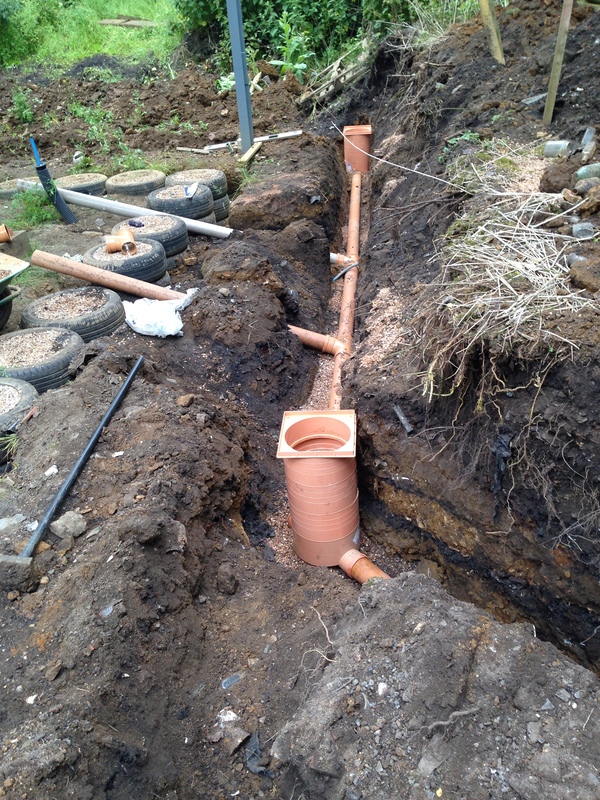 The sewerage pipes will take the waste water and other ‘stuff’ from the house to a septic tank on the edge of the site, by the hedge. 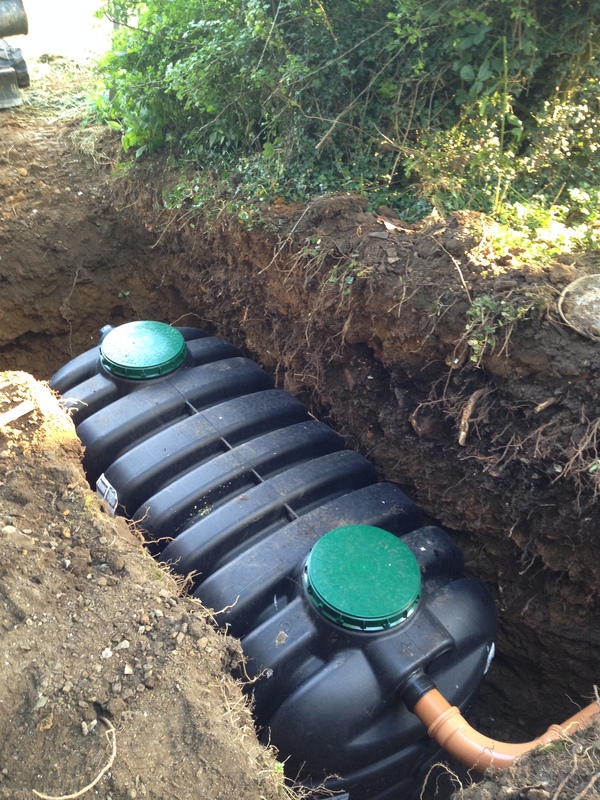 On top of this, along one side of the house, we also laid a rainwater drain, to take water from the roof away from the site once the rainwater storage tanks are full. 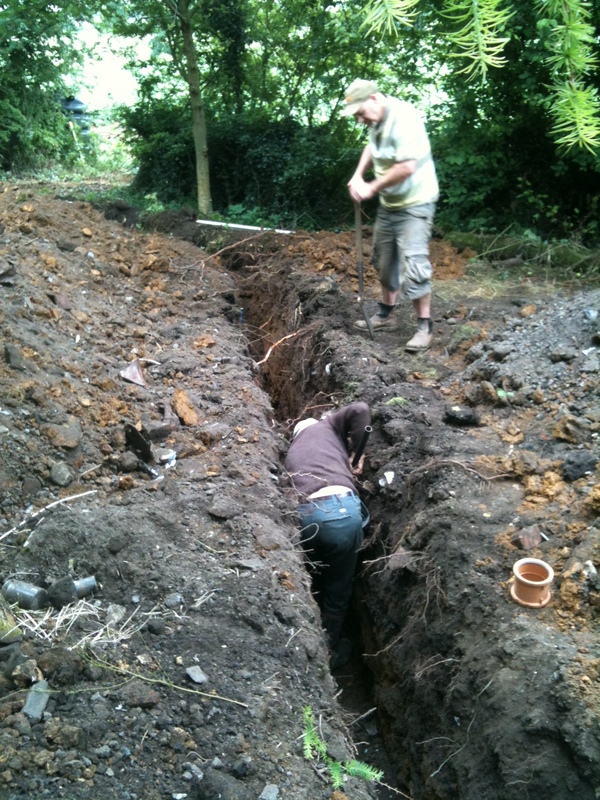 Rob digging the next leg of the trench, down the short side of the house. 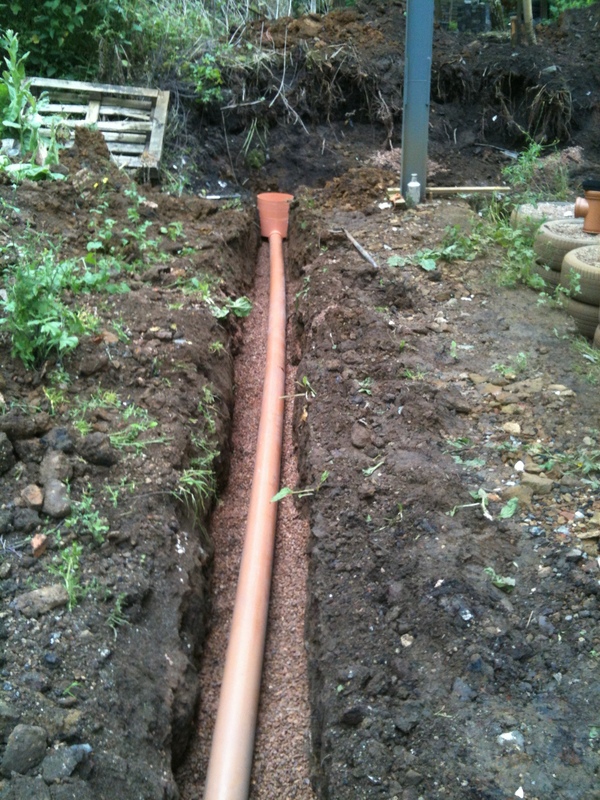 This trench is for the sewerage pipe and the rainwater drain. 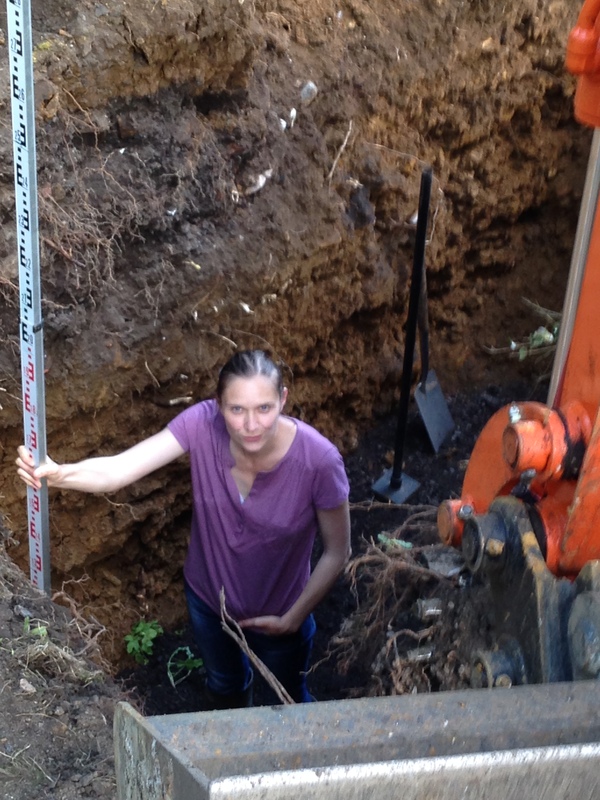 Katie checking the fall of the trench. 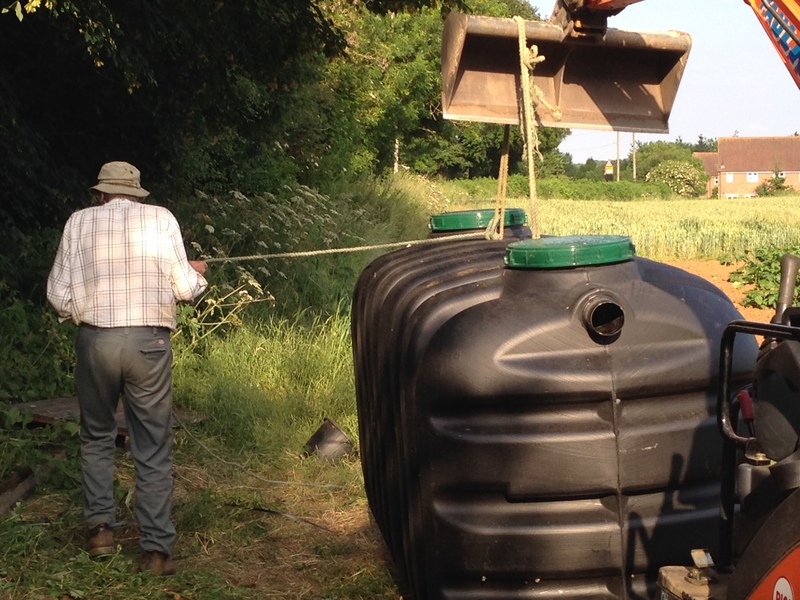 It has to deepen by a minimum of 25mm in each metre’s length to keep the turds on the move. 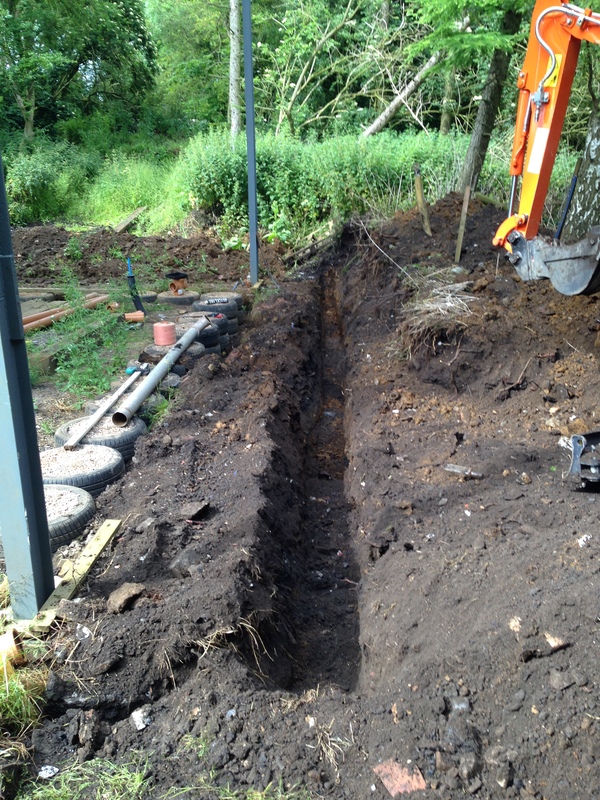 Once dug to the correct depth, the trenches were lined with a few inches of gravel, to protect the pipes and ensure an even gradient. 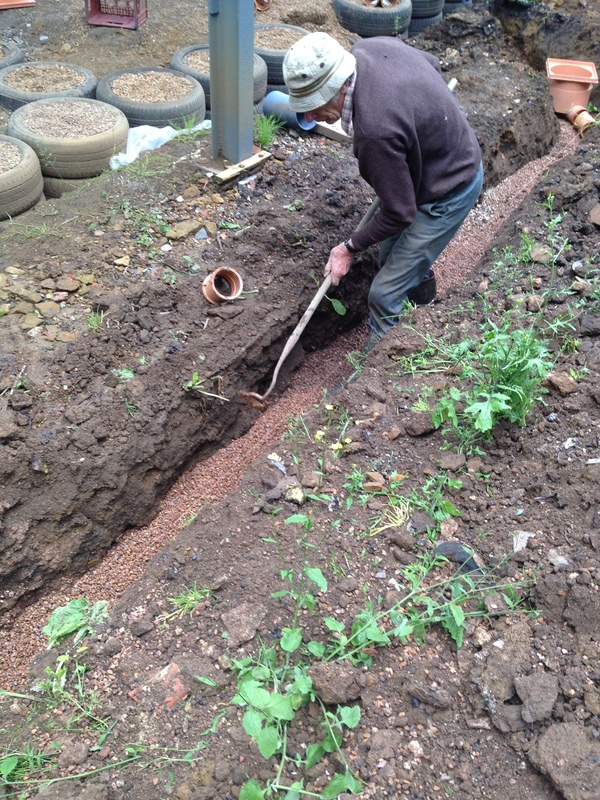 Here Chris is levelling the gravel to the correct depth before putting the pipes in. 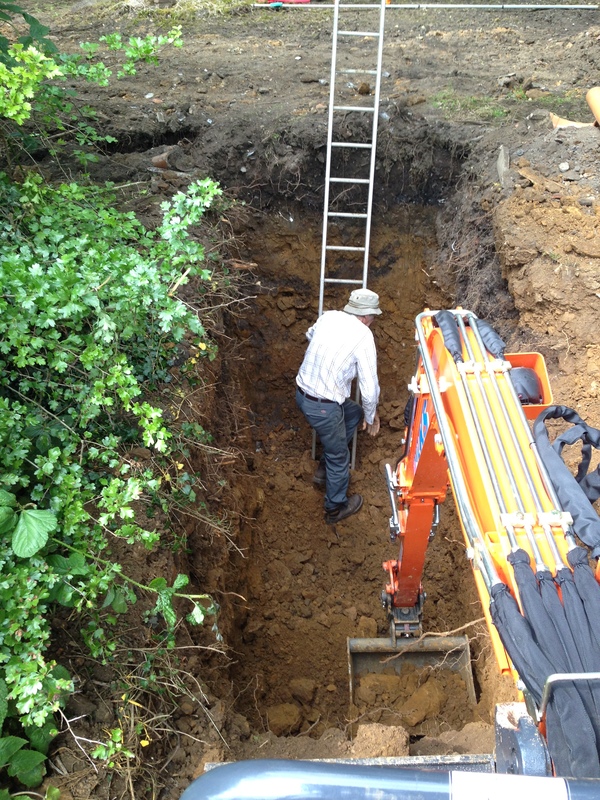 The task of levelling got increasingly tricky as the trench got deeper, through a combination of the continued fall and it passing through a raised part of the site. 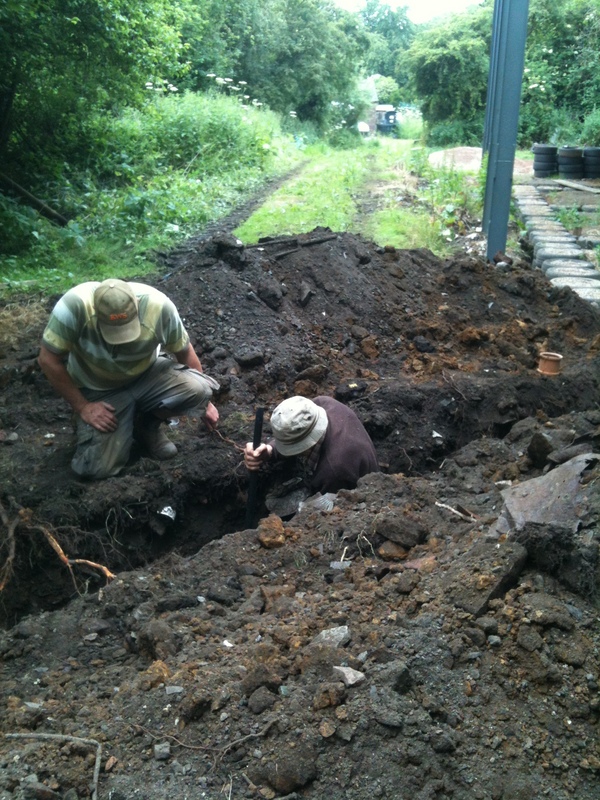 Just as well Chris is tall – this part of the trench was above my head height! Getting deeper, note the inspection chamber at the direction change to help things flow and aid clearing when it doesn’t. 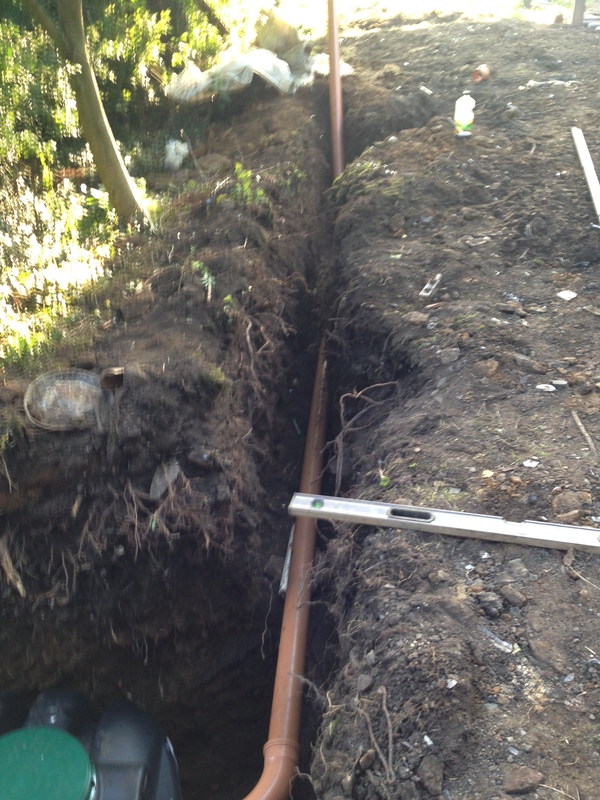 Once the pipe trenches were dug, then we had to tackle the big one – a hole 12ft by 5ft by 9ft deep! 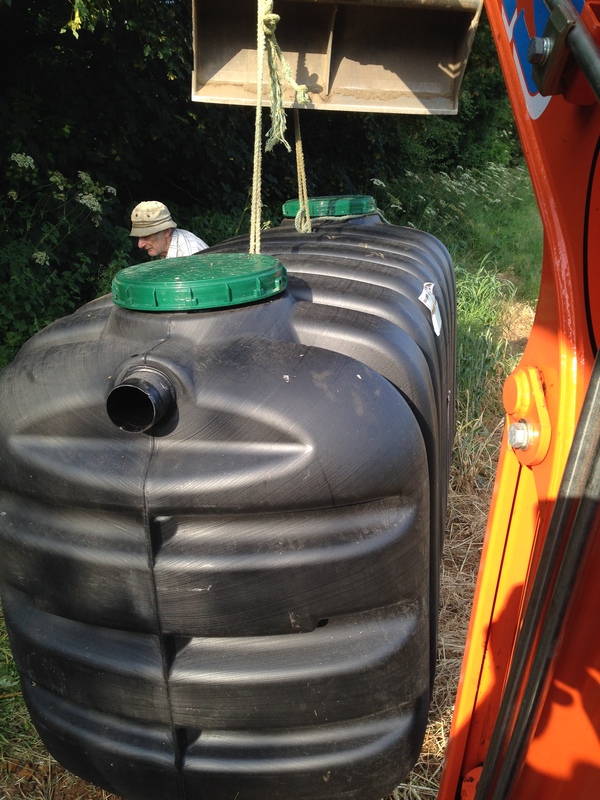 We have used a low profile septic tank, rather than the more common ‘onion’ shaped ones, or the hole would have had to be even deeper. 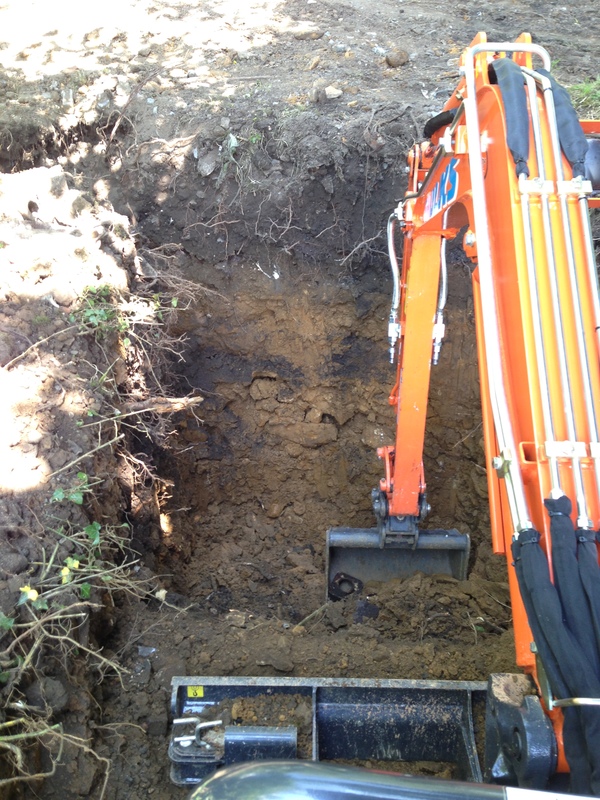 With trepidation, hoping that we wouldn’t hit solid rock before the hole was deep enough to accommodate the tank plus the required fall, we began digging. Chris helping to shift larger stones from the bottom of the hole, and demonstrate how deep it is. 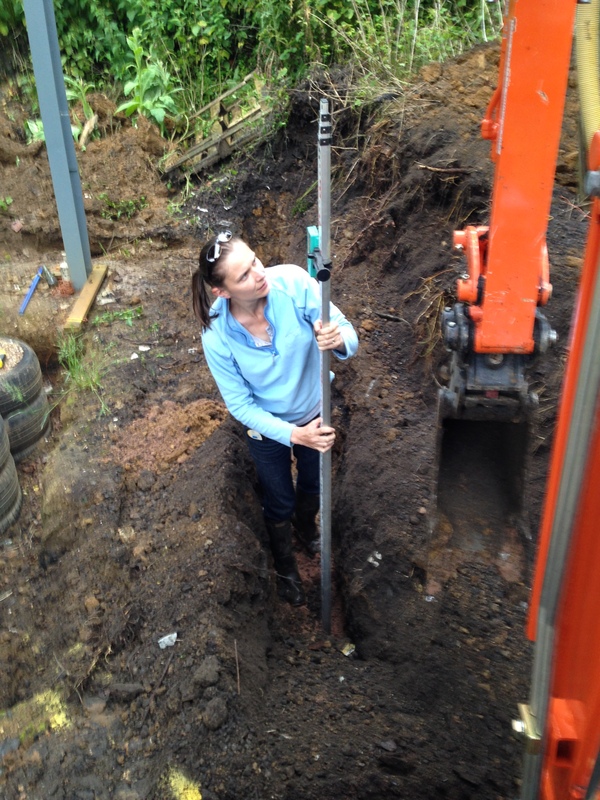 Katie checking the depth and levelling the base of the hole with road aggregate. 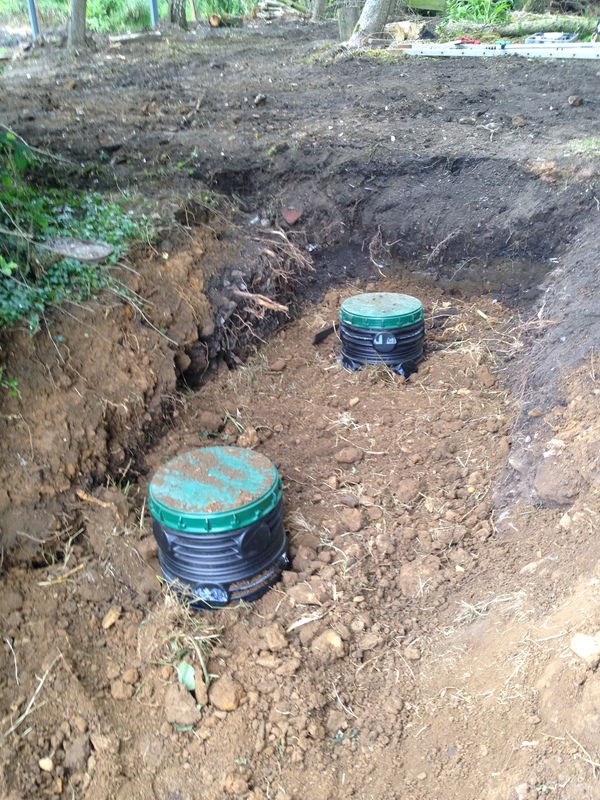 Once the hole was complete and level (we got this spot on first time!! 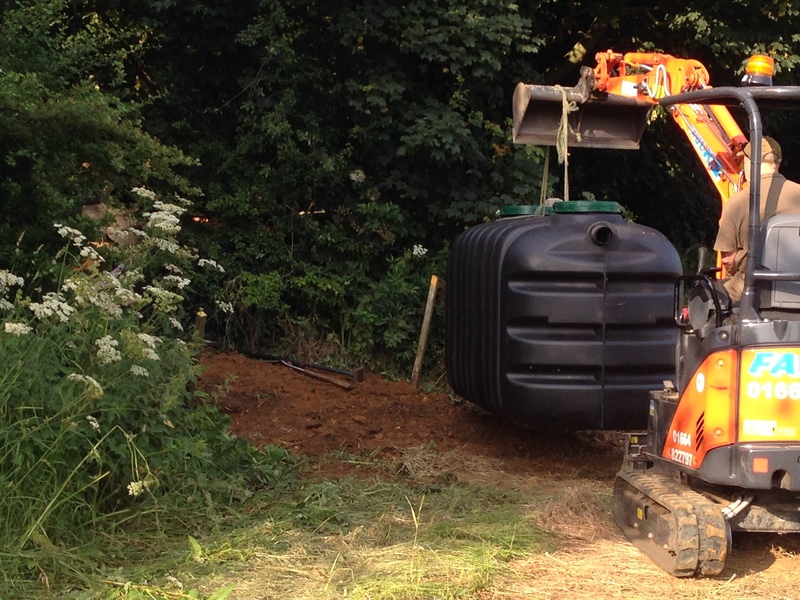 ), we lowered the tank in with the digger. And then filled in around it. This entry was posted in Uncategorized on July 8, 2014 by scampifield.